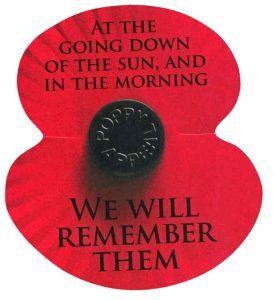 Our Remembrance Service tomorrow (11th November) starts at the earlier time of 10.45am. There will be a retiring offering for Poppy Scotland. At the end of the church service there will also be a short act of Worship at the Boys’ Brigade anchor (located to the side of the front entrance on Bath Street). After this we join the combined Remembrance Service at the Gourock War Memorial which starts at 12.15pm. Please feel free to join us at any, or all, of these services tomorrow.